Alton’s method steams the wings first, blots them, chills them, and then bakes them. The blotting and chilling is key, extracting moisture from the skin. The one problem I had was that he chills them on a wire rack (which is optimal if you can) but my wire rack is too big for my fridge. I made this recipe twice, and the first time, I just chilled it in a tray, but they didn’t crisp up enough. The second time, I chilled them on a tray again, but I made sure to turn them half-way through to allow for drying on both side, and voilà! 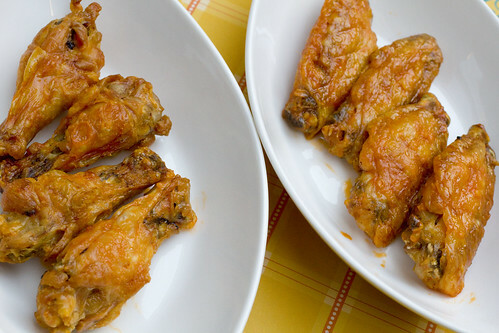 That little turn-over made a huge difference: crispy wings without being fried! You may even be able to fool a few people. 1. Set up a steamer while cutting the tips off chicken wings (can be saved for stock making). Separate the wings at the joint. 2. Put all the wings in the steamer basket and steam for 10 minutes on medium flame. Remove the wings from the steamer and pat dry with paper towels. 3. Lay on a plate or tray in a single layer and chill for 30 minutes. Turn them over and chill another 30 minutes. 4. 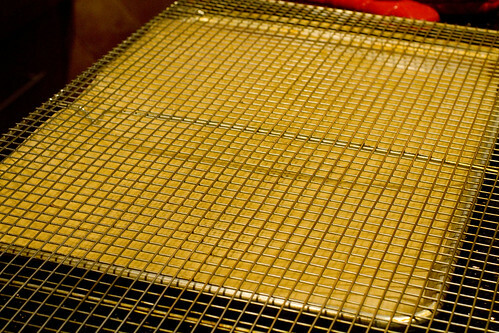 While they are chilling, preheat the oven to 425 degrees F. Set up a wire rack with a sheet pan under to catch drippings. Cover the sheet pan with parchment paper. 5. Place wings on wire rack/sheet pan set and roast for 15 minutes in the middle of the oven. Turn them over and roast another 15 to 20 minutes (depends on size), or until golden brown. 6. Two minutes before the wings are done, melt the butter and mix in garlic, hot sauce, and salt. 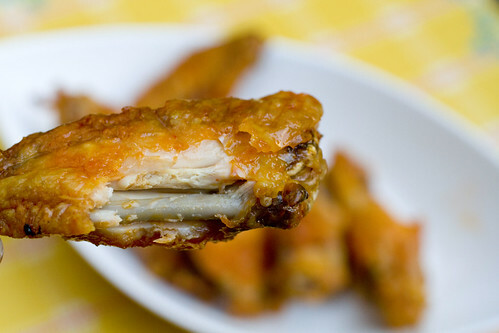 Place chicken wings in a large bowl. Toss and coat with sauce. Serve immediately. posted by jessica	at 02:48 PM	Filed under American, Recipes. You can follow any responses to this entry through the RSS 2.0 feed. Both comments and pings are currently closed. I am so glad to see this post! I was just thinking about how to make buffalo wings successfully without frying. 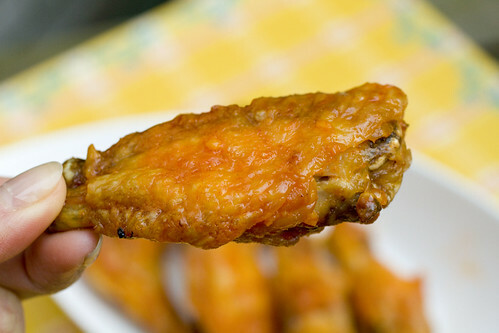 Your chicken wings are beautifully crisped, and I would be completely fooled into thinking they were deep fried. wow interesting. I have to try this method! What else are you making for the Football weekend? I wonder would this work with hoisin sauce too? Bet you can experiment with other condiment as well! Christine, they are crispy, yet less oily. I could down a lot more of these. Kim, I did the two batches on two separate days. The first time, we had friends over to eat them with us. The second time, Lon and I ate it all o ourselves. I think wings are great with tons of different flavors! I saw this episode! Your wings look PERFECT! Woah. I’ll have to try this out. Goodness! OMG, I can’t believe that this is not fried. Totally bookmarked! Do you think it will be alright if I add salt and pepper to the chicken before steaming it? I love crispy chicken wings but not with spicy sauce. Thanks. Ram, that should be fine. Try this sauce I use on dumplings. I think it would be good on wings too. I was totally shocked when I found out that the deliciousness of buffalo wings was only due to two ingredients. I definitely imagined that they were more complex than that! Thanks so much for the recipe. I just made them for lunch, and they were delicious. I have eaten a lot of wings…nearly all fried…and found these to be just as good, texture-wise, as fried wings. 15 minutes after eating them, I feel good, whereas I usually regret eating fried wings due to all the oil. The process takes 2 hours from start to finish, but it’s minimal labor-maybe 10 minutes, tops, of actual prep work. Definitely going to be using this recipe again for the super bowl. For some reason, despite having seen this episode eight or twenty times (I have an unhealthy Good Eats obsession), I always thought Alton Brown fried his buffalo wings! This method looks easier (despite having more steps) for someone like me, who has never fried before. Brian, so glad you liked it, and feeling less greasy and sleepy is great. When you make them for Superbowl, please take a picture for me! Katie, if you ever do want to fry, it’s not difficult but it is kind of a pain, and there is lot of cleaning. For something like French Fries, I just do it, but from now on, these will be my house wings. Love this post.. thanks for showing this. I love the steaming step to get the fat out! I like the idea of not frying as well and I like most of what Alton Brown does. Also I read somewhere that a mixture of lemons and cinnamon simmering on the stove will get rid of a myriad of kitchen smells. While I agree that this recipe produces delicious wings, alton states in the episode that the wings are actually being fried in their own fat even though they are not being deep fried. Will, while the wings are sort of frying in their own fat, it limits the amount of fat, and as a technique, it’s not frying. I just found your site and love, love, love it. 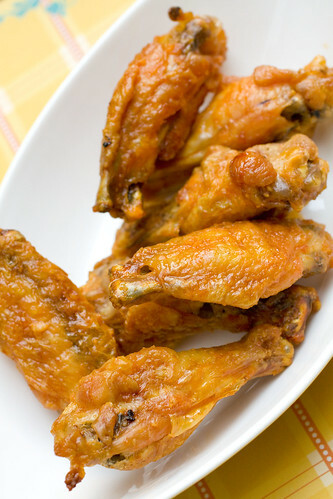 I tried Alton Brown’s recipe a couple months ago and was amazed by how crispy the wings were – even without frying. 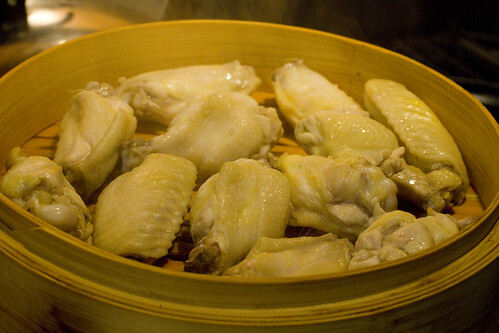 Granted chicken wings have a lot of fat, it’s great to get the same chicken wing taste without the added fat. Thanks so much Badj! SO sweet! Hope you find more to love here. I know it’s late but has anyone made these the night before and re-heated them the next day? Tomorrow is the super bowl, and my boys have tennis and hockey games during the day and will literally be coming home right at kickoff. I have all the ingredients and time to make these tonight, but just don’t know how they will re-heat. Any suggestions??? Melanie, I haven’t made them the night before but my best guess is that they’ll still be pretty good re-heated, but not optimal. Thanks for the recipe. My gang loved them!! Super Bowl Sunday was a success!! I made two batches, one with Frank’s Wing Sauce and the other with Thick & Spicy BBQ Sauce for those not wanting them spicy. I will be sharing with all my Wing friends!! Bridget, let me know how it goes over on movie night! Sounds like the perfect thing!